Many materials have a nonlinear stress-strain relationship, particularly at higher stress and strain levels. When analyzing objects made of such materials, you need to account for nonlinearities in the material properties. The Nonlinear Structural Materials Module, an add-on to the Structural Mechanics Module and the COMSOL Multiphysics® software, makes it easy to incorporate these effects by offering additional material models such as hyperelasticity, elastoplasticity, viscoplasticity, and creep. The Nonlinear Structural Materials Module augments the functionality of structural mechanics models in COMSOL Multiphysics®. You can customize structural analyses for your unique needs by combining the built-in material models and even defining your own models based on, for example, stress or strain invariants. You can create your own flow rules and creep laws, as well as your own strain energy density functions for hyperelasticity. The functionality for modeling nonlinear materials augments all of the structural analyses available with COMSOL Multiphysics®. This extends to the other structural mechanics add-on modules: the Composite Materials Module, the Fatigue Module, the Multibody Dynamics Module, and the Rotordynamics Module; as well as the MEMS Module. 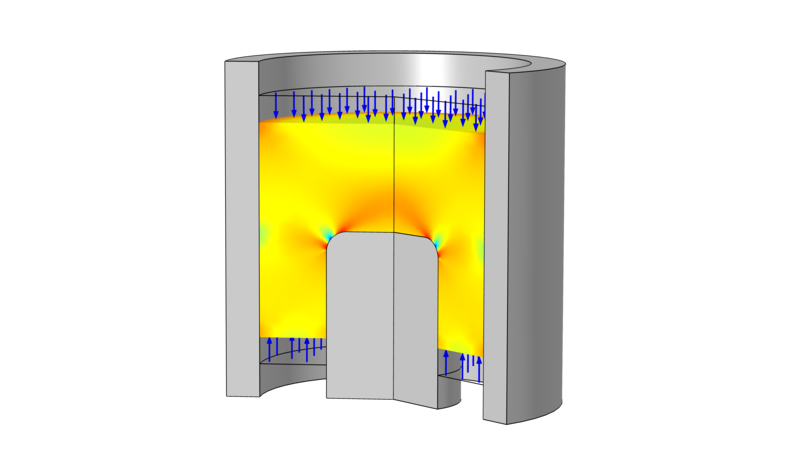 Additionally, as with every COMSOL Multiphysics® add-on module, there are built-in multiphysics capabilities for modeling thermal effects and fluid-structure interaction, for example. The Geomechanics Module, a similar but separate add-on to the Structural Mechanics Module, is specifically developed for materials common in geotechnical applications such as soils and rocks. The Nonlinear Structural Materials Module contains dozens of material models to help you model a wide range of solid materials. 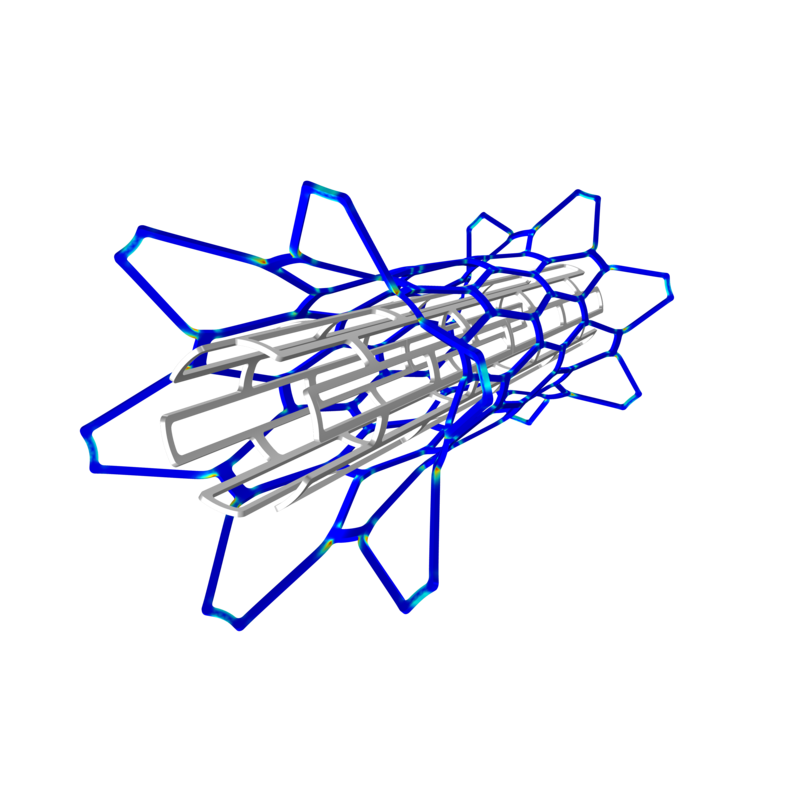 Hyperelasticity is commonly used for rubber and biological tissue; the plasticity and creep models are predominantly used for metals; porous plasticity is intended for powder compaction (metals as well as pharmaceutical pills); the damage models are mainly applicable for brittle materials, like ceramics; and shape memory alloy models are useful for materials like nitinol. 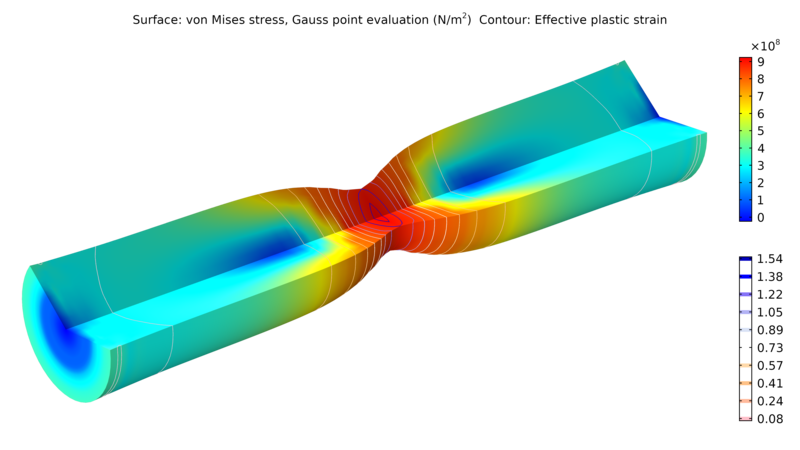 An example of necking, this model analyzes a cylindrical metal bar subjected to a tensile load. An elastoplastic material model is used with nonlinear isotropic hardening. A porous plasticity material model is used in this powder compaction example. The results show the stresses after compaction, which is depicted by the arrows. A biomedical stent is simulated with the Lagoudas shape memory alloy material model, showing the stresses in the stent and the martensite volume fraction. 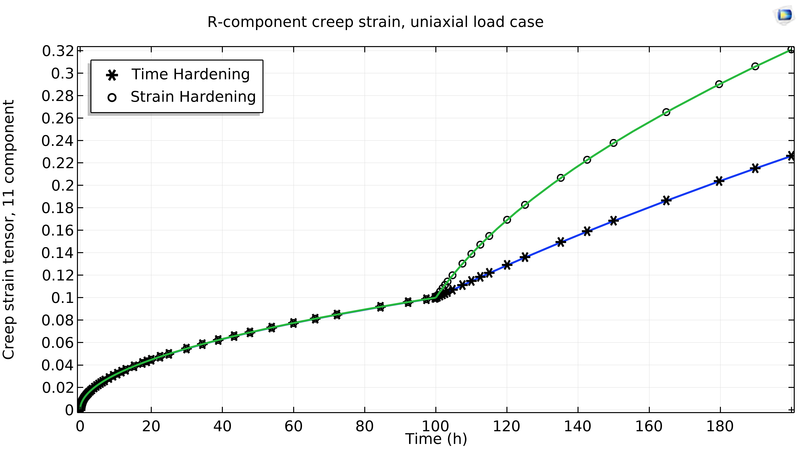 A NAFEMS benchmark problem, this example model demonstrates the difference between time-hardening and strain-hardening creep. The Application Builder, included in COMSOL Multiphysics®, enables you to build simulation applications that further simplify the simulation workflow by enabling you to restrict the inputs and control the outputs of your model so that your colleagues can run their own analyses. Working with specific material models, this functionality is especially useful for testing how different materials affect a simulation. With specialized applications, you can easily change a design parameter, such as a geometrical dimension or material property, and test it as many times as you need without having to know the inner workings of the software. You can use applications to run your own tests more quickly or distribute applications to other members of your team to run their own tests, further freeing up your time and resources for other projects. This example application computes the stress distribution (surface plot) and yielded volume fraction in a pressure vessel that exhibits nonlinear behavior.